With the London Labour Party Conference due to take place this weekend. 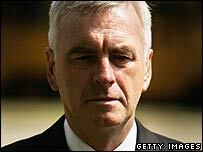 Labour leadership contender John McDonnell – former deputy leader of the Greater London Council before Thatcher abolished it, of course – has launched a ten-point manifesto for London. The centrepiece of the programme is a revival of the GLC’s famous 'Fares Fair' policy of making public transport affordable, launched in 1981, which the courts ultimately ruled illegal. And I thought McDonnell insisted he wasn’t an eighties revivalist. But anyway, here’s the full list. Nothing that democratic socialists will have any difficulty with. The April Theses it ain’t. If anything, I reckon the call for a £7 an hour minimum wage is a little on the low side. Somebody remind me, what’s the figure for the Council of Europe Decency Threshold these days? McDonnell comments: 'This alternative programme for London will dramatically improve the quality of life for Londoners by striking at the roots of the Capital's environmental, social, and economic problems. 'London is one of the richest cities in the world but Londoners don't share in its wealth and opportunities. By using the wealth created in London to invest in its transport, environment, housing and industries we could transform the life of many of its citizens.